I am probably not the greatest soccer fan. But some of the matches during the World Cup 2014 are a must-see. Take France vs. Germany for example. This year both teams reached the quarter final and fans on both sides were thrilled - and scared - to find out which team will eventually win. So after my photo job in Magdeburg that day, I called a friend and asked him about his plans and where to see the game. He invited me over to his place and told me that his French roommates wanted to go out to a public place later on. I was so surprised to see 5 girls in the bathroom of his small apartment, dressed in blue, white and red, painting French flags on their faces. Forty minutes later, we were standing amongst hundreds of Germans and maybe 15 French to watch the game. Only 30 minutes left and Germany one goal ahead. I was standing next to our French friends. Despite being a clear minority, the volume of their cheering and singing could easily compete with the noise of the Germans. The goal was shot in the seventh minute already. From that moment on, the mood among the French shifted slowly from excitement to despair. The cheering when someone from the French team ran for a goal was immediately followed by a groaning when the goal was missed. And the colorful thick paint on the faces could not conceal the growing sadness. After the goal. 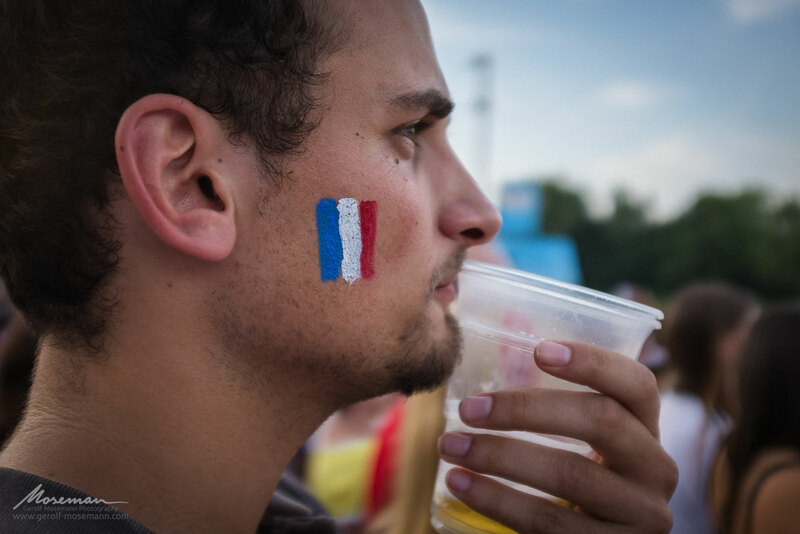 French fans at a public viewing party during the world cup quarter final 2014. “After all, it was just a game” said one of the French girls to me, secretly trying to wipe her wet eyes. 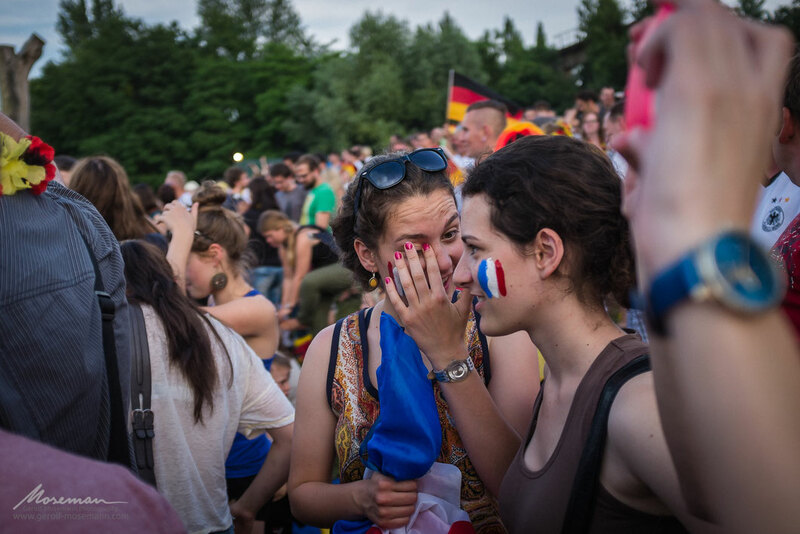 Yet after the loss for France, tears were soon followed by smiles. Some Germans even came, hugged the French and gave comfort, whereas the French congratulated the Germans. It was somehow an overwhelming scene. Because - like the girl said - after all it was “just a game.” I visualized that the same day, a hundred years ago a picture like this would have been unthinkable and that our great-grandfathers were sent to war against each other. And now we celebrate together the finals of the world cup as close friends, sharing joy and distress. It seems so insignificant. But given our history, it is actually amazing. 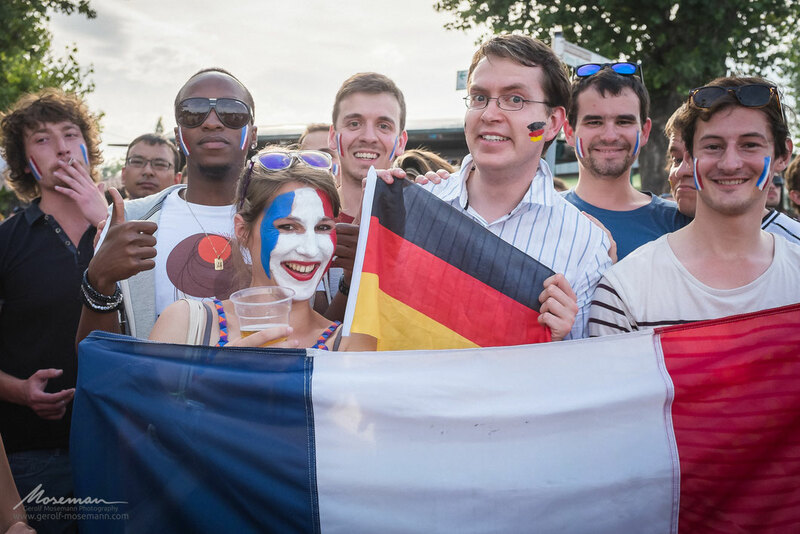 World Cup 2014 quarter final: Germany vs. France. Good friends after all.